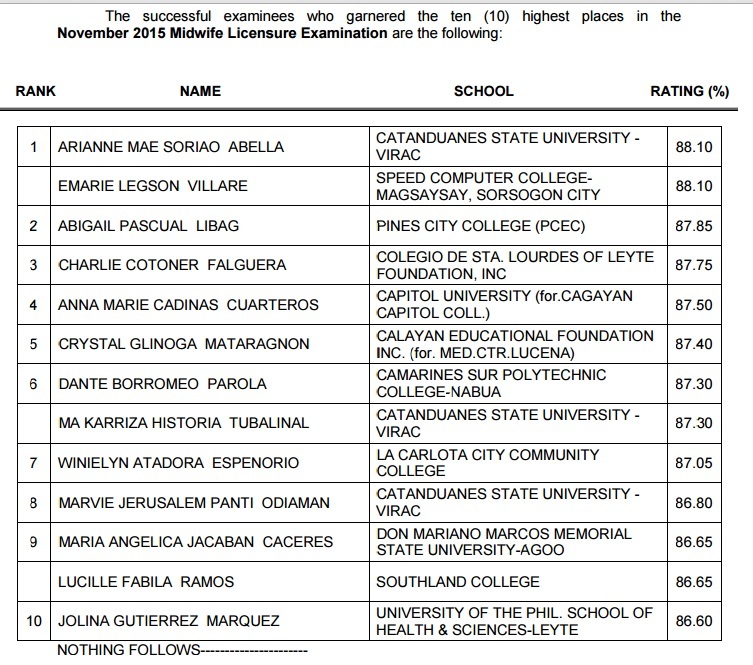 MANILA, Philippines - Colleges and universities outside Metro Manila dominated the November 2015 Midwife board exam with Catanduanes State University (CSU) - Virac and SPEED Computer College Magsaysay, Sorsogon City graduates took the highest place with 88.10 percent grade. Pines City Colleges, Colegio de Sta. Lourdes of Leyte Foundation, Inc, Capitol University (Cagayan) and Calayan Education Foundation Inc. graduates placed second to fifth respectively. Midwives board exam was conducted in the cities of Manila, Baguio, Cagayan de Oro, Cebu, Davao, Iloilo, Legazpi, Lucena, Tacloban, Tuguegarao and Zamboanga last November 7 and 8, 2015.